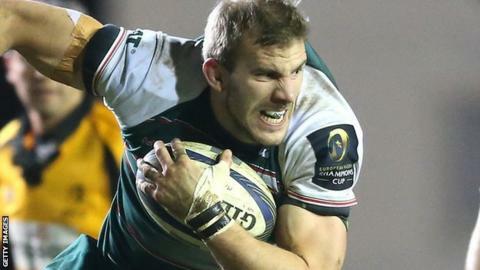 Flanker Tom Croft says Leicester Tigers cannot afford to let Treviso be European Champions Cup party poopers at Welford Road on Saturday. If Munster beat Stade Francais earlier in the day, Tigers can secure top spot in their group and a home quarter-final with victory over the Italians. Leicester have a perfect winning record in Europe this term, while Treviso are winless in all competitions. "We have to win and Treviso will be there to spoil the party," Croft said. Talking to BBC Radio Leicester, the England international added: "We need to focus on our game and be as clinical as possible." Leicester centre Matt Smith, who signed a contract extension with the Premiership side on Monday, said the penultimate pool game is a "massive" occasion for a side that failed to reach the knock-out stage in Europe last season. "We are doing well in Europe at the minute, but if we slip up on Saturday then all the games against Stade and Munster don't mean anything," Smith said. "If we don't get it right on Saturday it will be a big disappointment."